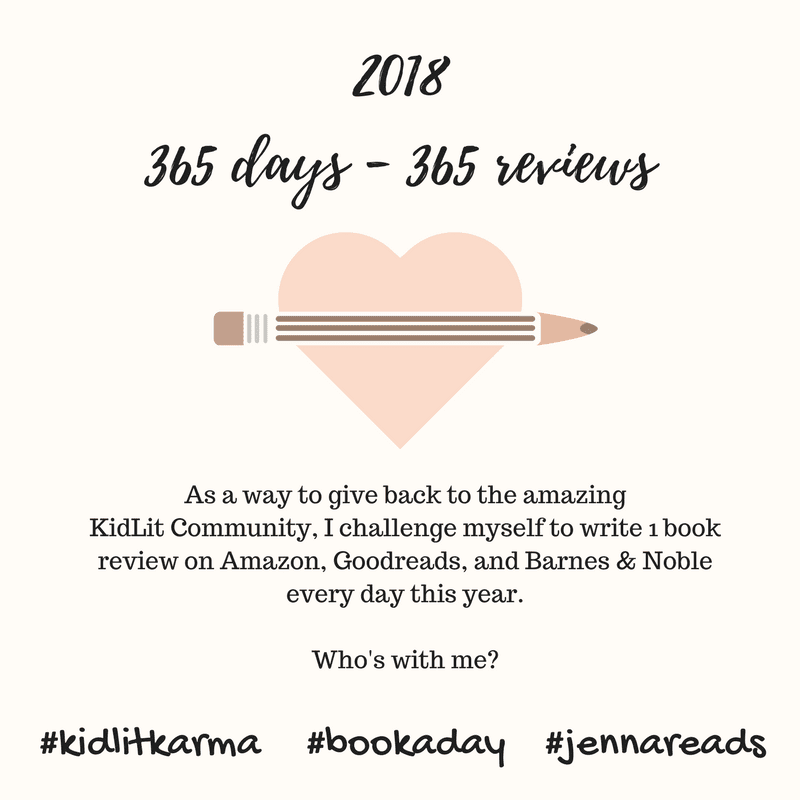 Posted January 8, 2018 by Jenna & filed under KidLit Coffee Talk. Happy 2018! Thank you for joining me for KidLit Coffee Talk. Today, I’m so excited to have my friend Shelley Kinder here with me. Shelley and I met through our publisher, Clear Fork Publishing. She was kind enough to share a virtual cup of coffee with me and chat about her debut picture book, Not So Scary Jerry. 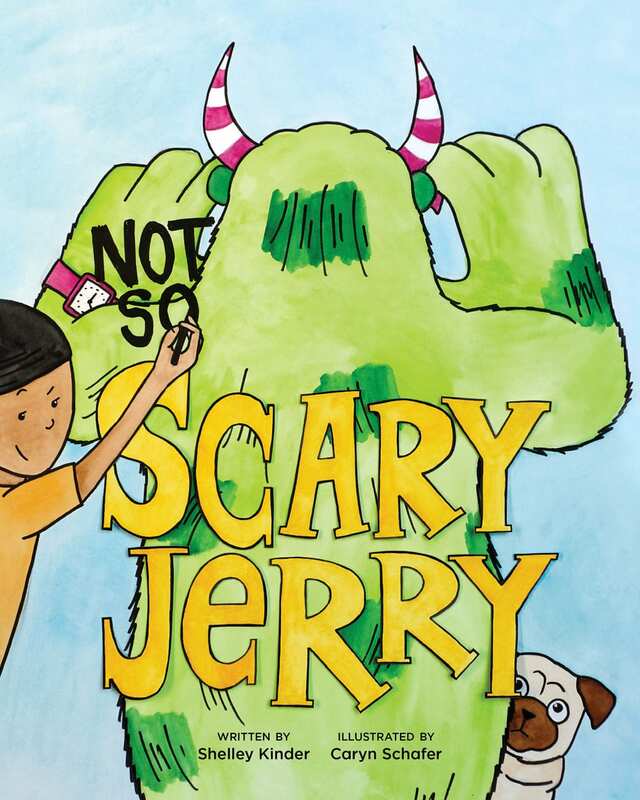 Not So Scary Jerry was released in September 2017 with Clear Fork Publishing and was illustrated by Caryn Schafer. Despite the freezing temperature, I’ve got my Dunkin Donuts iced coffee. What kind of coffee (or tea) do you like to drink? I don’t drink coffee or tea on a daily basis, but I’m learning more about the benefits of coffee, so I’ve been drinking it more. I wish I could be the person that drinks it with no sweetener, but I’m definitely not that person. I add milk and organic maple syrup, which tastes amazing. When I drink tea, it’s usually green tea with honey and sometimes lemon. Our house runs on the cold side, so these warm drinks are nice this time of year. I’ve had a writer inside of me since childhood, but it took me a really (I mean really) long time to do something about it. When my oldest two were maybe three and four, my interest in picture books really came alive and I began to dabble in writing. That was around 2012. Then, in 2014, I took a local writing class, which ignited my fire more. Then, in 2015, I wrote a rhyming story for Susanna Hill’s Halloweensie contest and won. That really ignited something in me, and I was determined to make writing a huge part of my life. 2017 was an exciting year for you, with your first picture book published! Tell me about Not So Scary Jerry. Jerry is a quirky monster who just can’t get it together in the scary department. He’d rather be painting rocks, giving pedicures, or thumb wrestling, although cooking and hugging are probably his favorite activities. Friendship and self-acceptance are the major themes in the book. My illustrator, Caryn Schafer, brought an adorable pug into the story. I love his expressions. We call him Burrito. Ha ha, I love Burrito! Jerry has quickly become one of my favorite picture book characters. His quirks are so endearing. What was the most exciting part of the publication process? What was the hardest? It was exciting holding the book for the first time, but I think I was even more excited when my Kirkus review came in, and it was positive. The hardest thing for me was probably waiting – for the book to be finished and for the Kirkus review to come back. Yes, the waiting can be so hard. What else are you working on? My mom is illustrating my second book, called The Masterpiece, about God painting the sunrise into the sky. She’s putting in a lot of hours right now. God bless her. We have periodic meetings to touch base and make sure everything is on track. I’m sort of bouncing all over the place right now with my writing. I’m entering a story into the KidLit College contest, so I’ve been working a lot on revisions for that. I’m also working on a faith based story that I’m highly passionate about, but can’t seem to get it quite right. Yet. I think I need to pray more about that one. I can’t wait to read The Masterpiece. How has life changed for you since becoming a published author? Life has changed in some ways, but my life is mostly the same, with the added tasks of marketing and promoting my book. Now, I have to manage my time more wisely, leaving time for both writing and marketing (and fun interviews like this one). I agree, good time management is so important for a writer to have. What’s one picture book you loved when you were little and a more recent one you love now? Are You My Mother? was a childhood favorite. I also loved Dr. Seuss’s ABC book. I mean who doesn’t love a Zizzer-Zazzer-Zuzz? It’s hard to pick just one recent favorite, so I’m going to cheat and list a few: Creepy Carrots (the ending is genius), No, David! (I fall more in love with David each time), and Froodle (I love made-up words and sounds, so this book just fits my personality). There are so many more. What a hard question! There are just so many amazing picture books on the market today, it’s hard to choose just one! Right now, I’m reading Perfect Ruin, a YA SFF by Lauren DeStefano. What are you currently reading? Wonder just came in the mail, and I plan to start reading it soon. I would have gotten it from the library, but the holds list was way too long. You will LOVE Wonder. Last question, what is one thing most people don’t know about you? I’m not the typical writer in the sense that I was the kid who always had a book in her hand. I did read, but I definitely wasn’t a bookworm like some of my friends. Even today, I read mostly picture books and rarely pick up a novel. When I do read a novel, I like it to have a little romance in it. I loved I’ve Got Your Number, by Sophie Kinsella. If I ever venture into novel writing, I think I’d enjoy writing something with that sort of feel. Or possibly something deep and spiritual (with a little romance). I have no idea where this writing journey will take me, but it sure is fun! Thank you, Jenna, for having me. I hope you have an amazing 2018! Thank YOU so much for joining, Shelley! Posted January 2, 2018 by Jenna & filed under News. Happy 2018 to all of my KidLit friends! I’ve been thinking a lot over the past month about how I can give back to this wonderful community. I wish I could buy every picture book that’s published, but unfortunately that’s just not possible. One thing I can do that doesn’t cost a penny is review the great books I read. So, as a personal challenge for 2018, I’m going to try to post one review on Amazon, etc. every day. That’s a huge goal. I don’t promise that my reviews will be the best ever written. They may only be one or two sentences. But I know how important reviews are to authors, so I promise mine will be honest and heartfelt. In other news, next Monday will see the return of KidLit Coffee Talk. Thanks for stopping by. I hope 2018 is your most creative year yet! Posted October 30, 2017 by Jenna & filed under News. 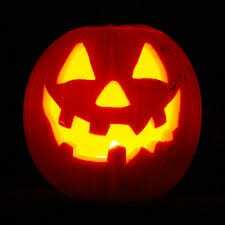 The amazing Susanna Leonard Hill has, once again, organized the Halloweensie Contest for Children’s Writers. The challenge: write a Halloween story for children no longer than 100 words! The words candy corn, monster, and shadow must be included in the story (candy corn will count as 1 word). This was not an easy feat. Here is my entry. Click here to read all of the other amazing stories! CRASH! Evan popped out of bed. His eyes went to the nightstand. The candy jar was gone! On the floor, leading out of his room, was a trail of candy corn. He grabbed his pirate sword and followed the trail. MUNCH MUNCH MUNCH! It was coming from the kitchen. He crept closer and noticed a monster-shaped shadow on the wall. It was just his little sister, shoving fistfuls of candy corn into her mouth. Relieved, Evan giggled and enjoyed a midnight treat with his sister. Posted October 23, 2017 by Jenna & filed under KidLit Coffee Talk. Thank you for joining me today for KidLit Coffee Talk. I’m so excited to have the wonderful Ariel Bernstein with me today. Ariel and I first met last April at #nErDCampNJ in Chatham, New Jersey. We were both on the Debut Author Panel and have been friends ever since. Recently, Ariel and I sat down over a virtual cup of coffee and chatted about her debut picture book, I Have a Balloon. I Have a Balloon was released in September from Simon & Schuster/Paula Wiseman Books and was illustrated by Scott Magoon. I like a bit of coffee in my milk and sugar. Ha ha, I can appreciate that. Tell me a little bit about yourself and your writing journey. I’ve enjoyed creative writing ever since middle school and initially wrote a lot of short stories. Once I got interested in writing children’s books, I joined SCBWI. I got a lot out of conferences and meeting other children’s book writers. I agree, SCBWI has been such an important part of my writing journey, too. Tell me about I Have a Balloon. It’s about Owl, who has a shiny, big, red balloon, and Monkey, who wants the balloon very much. It’s not a book about sharing, but about realizing the value in what you already have and being okay with not getting everything you want. It’s one of my favorite picture books from 2017. What was the most exciting part of the publication process? What was the hardest? The most exciting part was seeing the illustrations by Scott Magoon! As an author, you never know how someone else will interpret your words or what their vision will be, so it was a wonderful surprise to see all the details Scott put into the story. The hardest part of publication is, not surprisingly, the wait. It took two years from when my editor acquired the story to publication, which is actually a very standard amount of time for a picture book! I’m working on more picture book stories, plus my chapter book series, WARREN & DRAGON, illustrated by Mike Malbrough (Viking Children’s). The first two books in the series will be out this August! I can’t wait for WARREN & DRAGON! How has life changed for you since Owl and Monkey’s release into the world? I get more notifications on social media of people reading and enjoying the book, which makes my day every time! And I have more events scheduled now to read the book, and that’s been a lot of fun. There’s nothing quite like seeing your book in the hands of a reader. What’s one picture book you loved when you were little and a more recent one you love now? I’ve always loved Maurice Sendak’s OUTSIDE OVER THERE. It feels like you’re in a dream when reading it. A more current picture book that I love is LEAVE ME ALONE! By Vera Brosgol. It goes in an unexpected direction, and gets funnier with each page turn. I just finished The Ghostwriter by Alessandra Torre. What are you currently reading? I’m just finishing up CROOKED KINGDOM by Leigh Bardugo. I haven’t read much young adult, and am glad I got a recommendation for this series from a friend. I wish there was a third book! I love Leigh Bardugo! Last question, what is one thing most people don’t know about you? I guess my critique partners know this, but I have trouble creating an outline for a book before writing it. I have a vague idea of what I want to write about, and then figure it out as I go. It’d probably easier if I was able to work with an outline though, as I often get stuck! Thank you so much for joining me, Ariel! Posted October 9, 2017 by Jenna & filed under News. Happy Monday, and welcome to KidLit Coffee Talk! 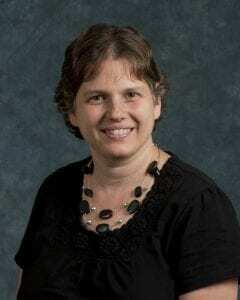 I’m so excited to have the amazing Sue Lowell Gallion with me on my blog. 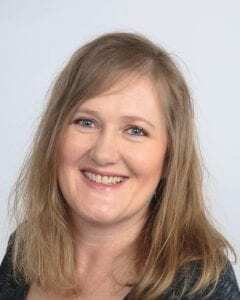 She is the author of Pug Meets Pig (S&S/Beach Lane Books, 2016 ) and Pug & Pig Trick-or-Treat (S&S/Beach Lane Books, 2017), which came out right in time for Halloween. This is a perfect read aloud for young children who are gearing up to celebrate at the end of the month. Sue was gracious enough to sit down for a virtual cup of coffee with me and chat about writing. What kind of coffee do you like to drink? That sounds delicious! Tell me a little bit about yourself and your writing journey. I’m proud to be an example of “it’s never too late to start a new career.” My background is journalism/PR, not creative writing. When my kids were in high school, I started looking at going back to school to become a reading specialist. I took a class in children’s literature at the community college, and our assignment to write an ABC picture book got me hooked. Ten years later, Pug Meets Pig was released. That’s really inspiring. So many writers I know did not start writing until later in life, myself included. Tell me about Pug & Pig Trick-or-Treat. This story came together right after the first Pug and Pig manuscript sold to Beach Lane Books/S&S. Pug shares many personality traits with my black lab mix, Tucker. Tucker’s reaction to the dog next door dressed in a skintight skeleton costume inspired the plot. Beach Lane bought this manuscript a year later, in 2014. It’s fun to share a non-scary Halloween book with kids. The heart of the book is about the freedom to be different from a friend, but think and act in a caring way. My children and I loved Pug’s reaction to his skeleton costume. How cool that it was inspired by your own dog! What was the most exciting part of the publication process? What was the hardest? Seeing Joyce Wan bring the characters and stories to life visually and working with the editor/art director team of Andrea Welch and Lauren Rille has been the most exciting part of the process. I’ll never forget opening the file of the first sketch dummy of the book and finding out what Pug and Pig and their world looked like! The creative team makes the finished book so much more than I ever could have imagined. The hardest part is the waiting! The gestation period of a walrus is 16 months. That’s just getting started for picture book publication. I’m working on other picture book manuscripts in the ongoing process of write/revise/submit/repeat and I have an early reader series project in the works that I’ve co-written with Ann Ingalls. 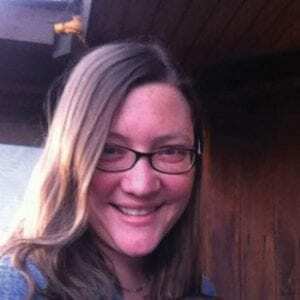 I’m on the hunt for a nonfiction picture book project, also. Sounds like you are very busy. How has life changed for you since your first book was released? The interaction with kids has been so much fun. My respect for all teachers, preschool on up, continues to increase! And I’ve loved my broader author role as a picture book and read-aloud advocate and ambassador. It was so nice to chat with you, Sue! To learn more about Sue, visit her website at http://suegallion.com. You have the chance to win a copy of Sue’s book, Pug & Pig Trick-or-Treat AND a poster designed by the talented Joyce Wan. To enter this giveaway, simply comment on this post and share it on Twitter or Facebook. Then, click on the Rafflecopter below. A winner will be chosen at random on Tuesday, October 17th. And don’t forget to subscribe to my blog. Good luck! Posted September 25, 2017 by Jenna & filed under KidLit Coffee Talk. Welcome to KidLit Coffee Talk, and thanks for stopping by. I’m thrilled to have my friend Leah Henderson with me today. Leah and I first met last summer at the WOW Retreat in Georgia. It was an unforgettable week filled with lots of writing and laughter. Leah’s debut middle grade novel, One Shadow on the Wall, came out this past June with Atheneum Books for Young Readers. The book’s main character, Mor, grabbed my heart and didn’t let go. It is a story of family, courage, and determination against all odds. I can honestly say it’s one of the best books I’ve read all year. Leah and I sat down and chatted over coffee and tea about One Shadow on the Wall and what life has been like since its release. Leah, thank you so much for joining me. This morning, I have my Dunkin Donuts Iced Coffee on hand. What kind of coffee (or tea) do you like to drink? It’ll definitely be tea. The kind really depends on my mood (genmaicha, chamomile lavender, ginger, lemon or so many more). Hmmm, not sure exactly what you’d like to know, I enjoy laughing and sunshine, and spending time with family and friends. If I’m not writing I’m definitely trying to plan my next trip. I love learning new things and exploring any and every place I can. Writing has always been something I enjoy, so I’m always taking classes and workshops, or going to writing conferences and retreats to continue growing as a writer. Tell me about One Shadow on the Wall. One Shadow on the Wall took root in my mind after seeing a young boy in Senegal West Africa sitting on a beach wall. It’s the story of a newly orphaned boy trying to decide between what is right and what is easy in order to keep a promise he made to his father. Laced with magical realism, it is about friendship and family, love and loss and finding one’s way through. This is a book that will stay with the reader long after the last page is turned. What was the most exciting part of the publication process? What was the hardest? There are so many exciting things in this rollercoaster-like journey of publishing. One of the best moments is seeing a kid reading your words (and hopefully enjoying what you’ve written). The hardest or the most discouraging part is when you’ve tried your absolute best and it’s not enough. Rejection is hard, and in this business you definitely have to build a thick skin . . . I’m still working on mine. Let me know when you figure it out! What else are you working on? I have a couple different stories floating around in my head at the moment. But right now I am really focused on a little road trip. That sounds fun. How has life changed for you (if at all) since Mor’s release into the world? Life hasn’t changed so much. 🙂 Still writing, traveling and trying to enjoy every minute life has to offer. I love your attitude. What’s one picture book you loved when you were little and a more recent one you love now? I loved Corduroy by Don Freeman because it was one of the first stories where I saw a true likeness of my mom and myself—a little brown girl with her own room being a key player in an adventure. There are so many great picture books out there, but two of my favorites are Lisa Mantchev’s Strictly No Elephants and Ribbit! by Rodrigo Folgueira. I love that. We’ve talked about how important it is for all children to be see themselves in the books they read. What are you currently reading? I just finished a terrifying YA novel, My Sister Rosa, by Justine Larbalestier. An arc of The Unlikely Story of a Pig in the City by fellow debut author Jodi Kendall. It comes out October 3rd and has all the elements of a good story…especially heart. Thank you so much for joining me today, Leah! 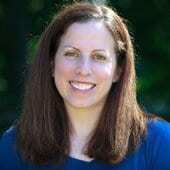 To learn more about Leah Henderson, visit her website at http://www.leahhendersonbooks.com. Posted September 4, 2017 by Jenna & filed under KidLit Coffee Talk. Welcome to another edition of KidLit Coffee Talk. Today, I’m excited to welcome debut author Julie Pepper. Julie and I first met through the amazing Clear Fork Publishing, our mutual publishing house. She was kind enough to sit down for a cup of coffee with me and chat about her new picture book, It’s Time! It’s Time! is a perfect back to school book, as it takes the reader through the main character’s experiences on the first day of school. It was released on August 8th and was illustrated by Anne Steele. This morning, I’m drinking a hot cup of Ocean City Coffee Company’s Pirate’s Blend. I brought a bag of this coffee home from our vacation last month to Ocean City, New Jersey. Julie, what kind of coffee are you drinking this morning? Wow, a coffee delivery company? That is so cool! Can you tell me a little bit about yourself and your writing journey? I’m a mom of three fun little humans aged 7 and 4 ½ (times two). I have also been teaching for 11 years, mainly in 5th grade. I’ve written ever since I could (almost) write. I believe my first original story was The Mean Meat and the Mean Met. I must have written that around the end of 1st grade. Meat was a boy and Met was a girl. I’m not sure why they were mean. I’m also unsure why I chose those names, but I find them pretty funny. Now that I’m thinking of it, I need to ask my mom, since I believe she kept that gem of a tale. Beyond that stunning debut, I wrote many short stories and poetry growing up. I remember hiding in my closet in Jr. High, and writing what I thought would be a spectacular novel. I had just finished Wuthering Heights and I wanted to write words that would elicit emotions like I felt while reading Emily Bronte’s work. Would love to find that in a box of memories one day! So many kidlit authors are, or were at one time, teachers. I think that gives us a unique perspective into the world of picture books. Tell me about It’s Time! It’s Time! is a simple and sweet story that follows a little boy from the moment he wakes up, until he steps foot into his new class on the first day of school. Maybe I should rephrase that. The reader doesn’t actually follow the boy–he is never seen. The illustrations are what he sees as he prepares for his day. It’s a minimal word picture book, and the story is told through the images. Anne Steele is the illustrator of the book, and her color choice is amazing. Anne and I grew up together in Amador County, so that was a pretty neat aspect of this project. My son inspired this one, as he started preschool last year, and he really enjoyed the new world that opened up to him. First off, I’m excited that there will be more It’s Time stories. We haven’t decided which one will come next, or when, but there is so much we can do with the concept. It’s Time to Go Potty, It’s Time for Bed, etc. My hope is that kids will not only enjoy the story and the pictures of It’s Time, but that they can also be used to help with daily routines, or to reduce fears of the unknown (It’s Time to Go to the Doctor, to the Dentist, etc.). I love that! These are all concepts that kids can easily relate to. What’s one picture book you loved when you were little and a more current one you love now? When I was little, I remember having a bunch of Little Golden Books. My favorite was Scuffy the Tugboat. The cover is embedded in my mind. Loved that little tugboat as a kid. Not sure how I feel about the theme of the story as an adult, but that would need to be an entire blog post of its own! I have read so many fantastic picture books in recent years, so it’s hard to pick just one! I love anything by Oliver Jeffers. I’m so in awe of author/illustrators, and he is just fantastic in both areas. I love Stuck because it’s quirky and fun, but I have to say my personal favorite of his is Lost and Found. The friendship between the boy and the penguin is so lovely and pure. I tried to pick one, but it looks like I got away with two! It’s so hard to choose one favorite when there are so many amazing picture books on the market today! Right now, I’m reading (and loving) The Jumbies by Tracey Baptiste. What are you currently reading? During the school year I try to read books that may interest my students. I want to be able to genuinely recommend books to kids when I’m having one-on-one reading conferences with them. Currently I am reading Katie Slivensky’s The Countdown Conspiracy. It’s about 6 kids from around the world who are chosen for the first mission to Mars. I’m only now just starting it, but I’ve loved what I’ve read so far. Kidlit is just awesome. Thanks for interviewing me, Jenna! Thanks so much for taking the time to chat with me, Julie! If you would like to learn more about Julie Pepper, you can find her on Facebook or on Twitter at @pepptalkin. 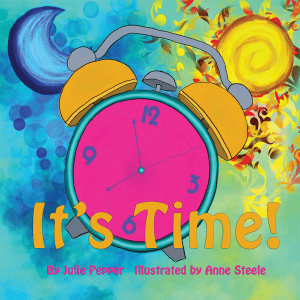 You have the chance to win a copy of Julie’s book, It’s Time! To enter this giveaway, simply comment on this post and share it on Twitter or Facebook. Then, click on the Rafflecopter below. A winner will be chosen at random on Tuesday, September 12th. And don’t forget subscribe to my blog. Good luck! Posted August 21, 2017 by Jenna & filed under KidLit Coffee Talk. Thank you for joining me for another edition of KidLit Coffee Talk. Today, I’m excited to welcome debut author Christine Sromek Laforet. I first met Chris through our mutual publishing house, Clear Fork Publishing. We’ve since bonded over the fact that we are both former educators. Chris and I recently sat down and chatted over a virtual cup of coffee about her new chapter book, Being Bree: Bree and the Nametag Worries. 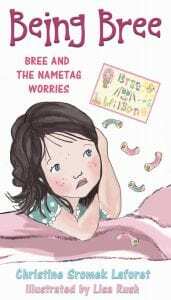 Being Bree: Bree and the Nametag Worries was published earlier this month from Clear Fork Publishing and was illustrated by Lisa Rush. I’ve got my usual Dunkin Donuts Cold Brew Iced Coffee. What kind of coffee do you like to drink? Good morning, Jenna. Thanks for inviting me for coffee. Don’t you just love the smell of a freshly brewed pot first thing in the morning? I certainly do. Today I’m enjoying a cup of hazelnut with a splash of milk. That is absolutely one of my favorite smells! Tell me a little bit about yourself and your writing journey. I taught elementary and middle school students in the Cleveland area for ten years before staying home to raise a family. But I’d say my interest in writing began years before college and kids. Back in the fifth grade, I was introduced to creative writing. I remember my teacher’s comment, “You’ll be a writer one day,” and sure enough, it happened (many, many years later, of course). I also remember typing out manuscripts and slaving over phone books in the library searching for publishing houses to mail stories to. Fast forward a few years (okay, maybe more than just a few years), when I heard about a children’s writing group at my local Barnes and Noble. I attended meetings, learned about SCBWI, and studied the craft of writing. My kids were young at the time, and it was difficult to find quiet periods throughout the days to write, but over the years, I completed a middle grade manuscript, received requests from agents for full submissions, and then collected a number of rejection letters. I didn’t give up, though. I kept writing and submitting stories until Essie White at Storm Literary Agency offered representation. She found the perfect home for my debut chapter book series, Being Bree, at Clear Fork Publishing. Becoming a published author was a life-long dream, and I’m glad to have persevered throughout the long journey. Congratulations on accomplishing this life-long dream. Tell me about Being Bree: Bree and the Nametag Worries. This is the first book in the Being Bree Series, and readers meet Bree, a gifted six-year-old whose imagination spins her worries out of control. It’s the start of a new school year, and Bree worries about the first day of school. Her nametag is supposed to help her make friends, but she worries about all of the bad things that could possibly happen to it. Bree takes belly breaths to calm her worries …until her nametag disappears. Now she must make friends without one. One of the reasons I wrote this story was to raise awareness about an under-represented group in children’s literature – the gifted community. From the very first line, “If I were a noodle, what kind would I be?” I tried to capture the reader’s attention and draw him into a gifted child’s creative mind. But gifted kids aren’t just creative and smart. They can also face many challenges due to their intense emotions and difficulty connecting with peers. By creating a character who, throughout the story, recognizes when her feelings start to spin out of control, I hoped readers (who also experience anxieties) would realize when their own feelings begin to change and then use some of the calm down techniques Bree models. I’m currently writing the third book in the Being Bree Series, and other story ideas are bouncing around in my head. But let me tell you a bit about Book 2. Bree and the Loose Tooth Worries releases early 2018. From the title, you can guess that Bree worries about losing her first tooth. But she quickly resolves those issues when she learns that the tooth fairy brought her classmate, Lauren, a bright and shiny ring. Bree wants the tooth fairy to bring her one, too, especially since she’ll need it to be in Lauren’s new club, The Girls with Bling. Bree accidentally swallows her tooth, however, and faces a new set of worries and problems. With only a few days before the club’s first official meeting, Bree decides to contact the tooth fairy and convince her to bring a shiny new ring, even though Bree doesn’t have a tooth to leave under her pillow in return. You’ll have the read the book to find out whether or not Bree’s plan works and she becomes a member of the Girls with Bling Club. This sounds fabulous. Now let’s talk picture books. What’s one picture book you loved when you were little and a more recent one you love now? I completely adored George and Martha by James Marshall. My mother said she read it to me a million times when I was young. As an adult, I’m still drawn to the friendship themes and enjoy the humor. There are so many wonderful picture books in circulation today —it’s hard to pick a favorite. But I really enjoy reading Mother Bruce by Ryan T. Higgins. The writing is clever and the pictures are so amusing … I even read it to my three teenagers! I can’t wait for the next book in the series. I’m currently reading an amazing YA fantasy – Graceling by Kristin Cashore. What are you currently reading? Right now, I’m critiquing a middle grade novel for one of my wonderfully talented writer friends. I’ve also started reading A Long Walk to Water since it’s on my daughter’s summer reading list and Linda Sue Park is presenting at the SCBWI Northern Ohio Regional Conference in September. I love chapter books, though, and Clear Fork Publishing has some pretty talented authors. I’ve started Alayne Kay Christian’s Sienna, The Cowgirl Fairy Series: Trying to Make It Rain and am totally in love with the story’s voice. The Enchanted Snow Globe Collection Series: Return to Coney Island by Melissa Stoller is next on my list. I’m also excited for the release of Emma Bland Smith’s new series, Zadie Jacobs CEO. Thank you so much for joining me, Chris! 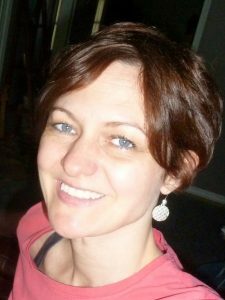 If you want to learn more about Chris, you can find her at http://www.christinesromeklaforet.com. You can connect with Chris on Facebook and on Twitter at @chrislaforet1. You have the chance to win a copy of Chris’s book, Bree and the Nametag Worries! To enter this giveaway, simply comment on this post and share it on Twitter or Facebook. Then, click on the Rafflecopter below. A winner will be chosen at random on Monday, August 28th. Good luck! Posted August 14, 2017 by Jenna & filed under KidLit Coffee Talk. Thank you for joining me for KidLit Coffee Talk. My guest today is the incredibly talented Lisa Amstutz. I had the pleasure of meeting Lisa last summer at the WOW Retreat in Georgia. She was an inspiring presenter, and I’ve since been a huge fan of her work. Recently, Lisa and I sat down over a virtual cup of coffee and chatted about her newest picture book, Applesauce Day. Applesauce Day was released earlier this month from Albert Whitman & Company and was illustrated by Talitha Shipman. I’m drinking my usual Dunkin Donuts cold brew iced coffee. What kind of coffee (or tea) do you like to drink? I love the smell of coffee, but the taste – not so much. I’m a big tea drinker: black tea in the morning and herbal at night. There’s a local farm that grows and sells mint teas, so we drink a lot of that. I started writing for adults about 12 years ago. I began by writing magazine and newspaper articles, then co-wrote a book on local foods that was purchased by a small trade publisher. My interest in writing a book on that topic for kids was what led me to children’s writing—and I’ve been doing it ever since! Thanks to connections I made at an SCBWI event, I started writing for the educational market in 2010, and have now written around 80 books for Capstone Press and other educational publishers. I signed with my agent in 2015. She sold Applesauce Day and another forthcoming picture book, Today We Go Birding, to Albert Whitman & Company, and we’re working on a number of other submissions. Wow, that is impressive! Tell me about Applesauce Day. Applesauce Day is based on a family tradition of making applesauce each year. We would buy bushels of Transparent apples in the summer and in one day, make enough sauce to last the year. It’s been fun to pass that tradition on to my own kids and create memories with them! The book celebrates this family tradition with a look back at past generations and at the future, using an old applesauce pot as a symbol of that continuity. Nothing I can share publicly right now, but I have several picture book biographies, a few more lyrical pieces, and a middle-grade work-for-hire project in progress right now. I can’t wait to hear more about these projects. Can you give me the name of a picture book you loved when you were little and a recent one you love now? One of my childhood favorites was Ezra Jack Keats’ Snowy Day. Now, wow – it’s too hard to pick just one. 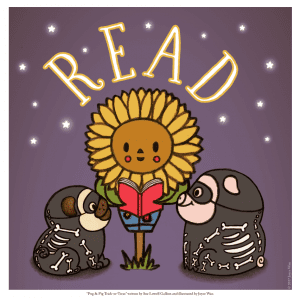 Owl Moon, Miss Rumphius, Goodnight Moon… the list goes on. Those are some of my favorites, as well. Currently, I’m reading The Bitter Kingdom by Rae Carson. What are you reading right now? At the moment, I am alternating between The Tiny Hero of Ferny Creek Library by Linda Bailey, The Curious Naturalist by Sy Montgomery, and A Distant View of Everything by Alexander McCall Smith. Thanks for inviting me to stop by! Thank you so much for taking time out of your busy writing schedule to chat with me! To learn more about Lisa, visit her website at http://www.lisaamstutz.com. Posted August 9, 2017 by Jenna & filed under News. Congratulations, Kim! You are the winner of a copy of Return to Coney Island and the Starbucks gift cards. Thank you to everyone who took the time to read my first KidLit Coffee Talk interview. Look for the next edition, which will go live on Monday, featuring the amazing Lisa Amstutz!